I am offering an brand new Hk Mark 23 Desert Tan .45ACP complete package that has been part of my collection for many years. 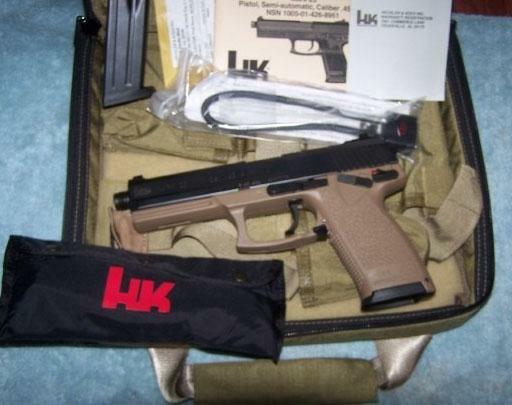 It is one of the estimated 500 Desert Tan models that Hk released in 1994. I am thinning out my Hk collection and this is one of many that will be listed here in the near future. NOTE: I am also selling a Hk4 NIB package and a Hk P7M8 Jubilee NIB. package. 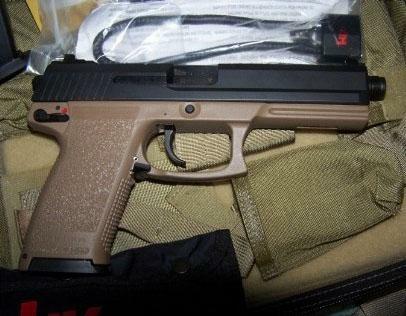 The Hk4 is listed on Sturmgewehr and contact me directly about the P7M8 Jubilee. NOTE: Please be aware of the legal status of this firearm and 10rd magazine capacity before purchasing. I do not ship to: CA and all other firearm unfriendly cities, counties and states. I do not ship outside of the Continental US including US territories. BUYER IS RESPONSIBLE FOR ALL CITY/COUNTY/STATE FIREARM REGULATIONS CONCERNING THE LEGAL STATUS OF THIS FIREARM. SHIPPING: FREE: USPS Priority Mail with tracking to your FFL. Shipping insurance is not included. Please contact me at Firearms Depot or at 928-522-6466 for more information concerning this pistol package. Thanks for the trade offer, but I am only interested in cash. I'm selling off much of my Hk collection for another endeavor.